If you have ever been asked to read a story aloud to a class of second and third graders, you know how hard it can be to find the perfect book. It has to take less than five minutes to read but not insult these elementary children by being too juvenile for them. Well, have I got the perfect book for you! The book starts in a traditional format with a rhyming poem that for these older children obviously is talking about a bunny. You may even get a few eye rolls from the crowd. How young does this person think we are?! Turn the page though, and watch the crowd go wild as the entire format of rhyming clues is turned on its head. Expect a delicious moment of stunned silence and then lots and lots of laughter. Filled with entirely silly moments, children will still enjoy trying to outguess the joke. And in the end, they will have one final surprise as a running gag turns on its heel. This is a book you must pick up and take a look at. It is delightfully silly, monumentally funny to the target audience, and a complete hoot. Make sure you are in the mood for laughing, or even better find a kid around 8 years old and laugh together. As I look at it, it is also a great choice for reluctant readers because there are plenty of pictures, lots of whitespace, and humor! This is not a picture book for small children who will not understand the joke. Save it for the jaded age of 7 and 8 year olds to get the best reaction. Hey, I just may have to volunteer to read to my son’s class this year just to be able to share this book. Appropriate for ages 5-8, older the better. Also reviewed by A Year of Reading. Holly was now placed with a family of her own after years in a residential home for teens. Fiona and Ray seemed to want her, but it might turn out the same as the last place where she was sent back. Best that she leave on her own terms and head to find her mother in Ireland where she was waiting. Holly dons a blonde wig that makes her look much older than her 15 years and calls herself Solace. From London, she hitchhikes her way across Britain. On the way, she meets kindness in surprising places and finds out more about herself and her past. There is magic in Dowd’s writing, filled with crystalline moments and complexity and no simple answers. 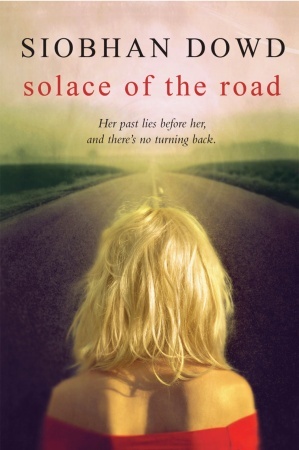 This road-trip novel has the essential ingredient of slow progression in self-awareness. Holly is a complicated character, filled with bravado, anger and confusion. She is portrayed with so many layers, that just discovering her is a joy. Holly’s use of an alter ego to understand herself is drawn with caring and a supreme gentleness. There are moments of stillness in the novel where insight is just around the corner, but then life intervenes and the reader must wait patiently for the next moment to come. Dowd uses the setting as almost its own character in the novel. Readers who have never been to Britain will still find themselves picturing it clearly in their head, hearing the birds, visiting the dark towns. This is a beauty of a character sketch created by a gifted author whose career ended way too early. Highly recommended for fans of problem novels, this book will stun with the quality of the writing. Appropriate for ages 14-17. Also reviewed by Abby (the) Librarian and Crossover. Boing Boing featured this great video of author/photographer Walter Wick and one of his complicated creations. This one appears to defy gravity.